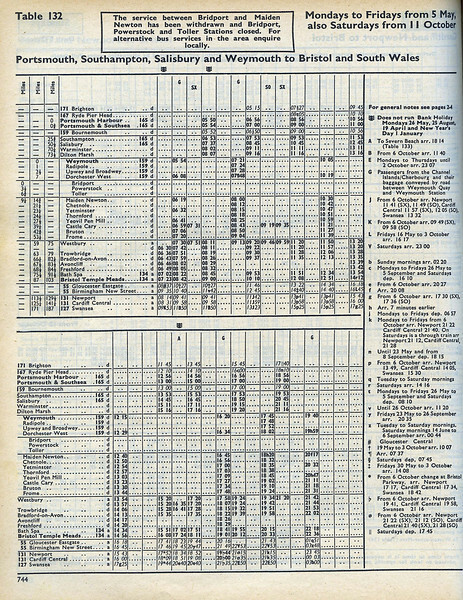 Although the Bridport branch formally closed on Sunday May 5th, the day this timetable commenced, the last train ran on Saturday 4th as there was no Sunday service. I guess that it wasn't possible to completely remove the table before it went to press in case there was a last minute change of plan, after all Bridport had been fighting closure since Beeching. But it was not to be and this remote backwater closed as planned but not without a last day jamboree. When a friend from school and I had ridden the Bridport branch before we had been the only passengers in both direction, but on the last day Maiden Newton resembled Clapham Junction and the train, a three car DMU imported for the occasion, was packed. The pubs in Bridport - home of JC & RH Palmers fine ales, did a roaring trade. The rest of the table is interesting, Portsmouth to Bristol every two hours in a Thumper. I did that journey a couple of times, boy was it tiring. The Southern DEMUs were never very speedy, and the incessant rattle of the drop lights and the dim lighting were reminiscent of Victorian days.